Ladies: Imagine going to see Wonder Woman in a movie theater filled with nothing but other women. Sounds fun, right? The Alamo Drafthouse certainly thinks so, which is why the geniuses behind our favorite theater chain organized a special women-only screening of the highly-anticipated superhero film at their downtown Austin location. Unfortunately (but predictably, which is just as unfortunate), a whole bunch of dudes are acting like big whiny weenies about it — hilariously oblivious to how their sexist attitudes further prove the need for this event. Yesterday, the Alamo Drafthouse Austin announced a special screening of Wonder Woman for women only in a Facebook post with the Beyoncé-approved caption, “Okay ladies, now let’s get in formation.” The screenings will both take place on June 6 — four whole days after the film hits theaters, so it’s not like this is some early sneak preview event that’s specifically excluding comic book movie fanboys, though the Drafthouse could totally do that if they wanted. And judging by some of the super dumb comments on their Facebook post, maybe they should. 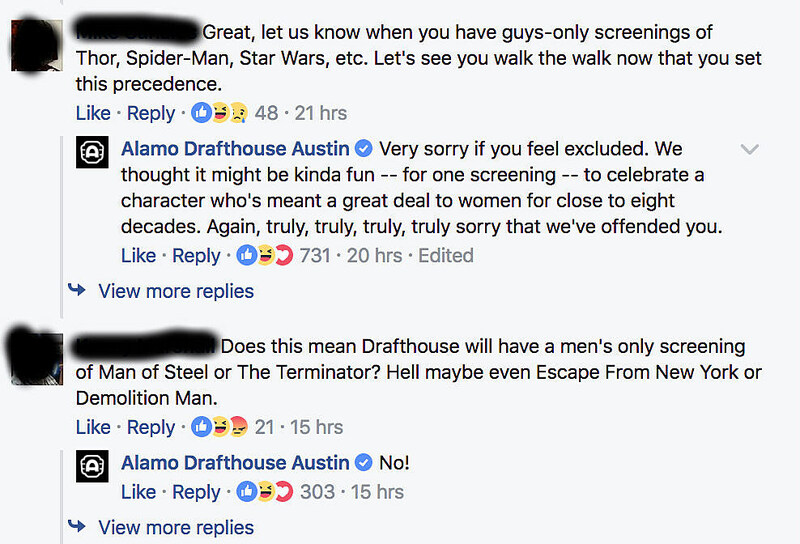 The most popular argument was something along the lines of, “So are you going to have an all-male screening of [insert other superhero movie title here]?” Having a women-only screening of a film based on an iconic female superhero who has inspired millions of women all over the world isn’t exclusionary, it’s not sexist, and it’s sure as hell not unfair. But if you want to make this about sexism, complaining that men are being intentionally excluded or mistreated based on their gender is one of the most absurd things I’ve ever heard considering, oh, the ENTIRETY HISTORY OF HUMAN EXISTENCE. By the way, Drafthouse event proved so popular that they added a second screening, which sold out in less than two hours — which is even more wonderful considering how many men threatened to boycott the theater over it. I’m sure they’re going to keep doing just fine without your business, guys.